Roses Russia. Fresh roses bouquets and baskets. Send roses of any colour, bouquets with roses, baskets with roses or huge amount of roses to Russia, Ukraine, Belarus, CIS with discounts and same day. 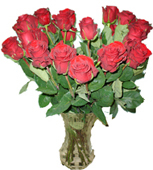 Roses delivery to Russia, Ukraine, FSU is available for 24 hours a day. Make your choice for roses now and your close friend, relatives r colleagues will feel your care. Your order will be distinctive and unforgettable. 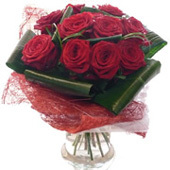 Roses of different colours are available in all cities of Russia, FSU for delivery to any occasion. Here you may shop for: Red roses, a dozen red roses, roses in a vase, white roses, pink roses, peach roses, yellow roses, velvety dark red roses. 17 roses of red and white colour make your bouquet distinctive. It shows the deepest feelings and say much without a word. 15 pink roses, 5 eustomas, 5 pistachio chrysanthemum, 3 white chrysanthemum, 7 statica, 4 carnations,greenery, eucalyptus in a basket decorated with natural ribbon. Yellow roses, light yellow gerberas, tea roses in a ceramic vase. 11 yellow roses, 5 yellow gerberas, 5 white roses. Fresh bouquet of 7 pink roses, 6 chrysanthemum, 8 alstromerias with greenery in a natural wrapping will be a great surprise for your beloved! Mothers day flowers arranged with gentle baby breath and stylish pearls. 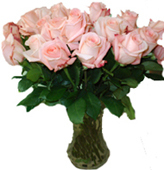 9 Pink roses with 5 baby breath, bergras, greenery and artificial pearls make this bouquet soft, gentle and beautiful. This a wonderful choice to show your care, inspiration and true love to your mother, true friend or beloved. An elegant basket mix of roses. 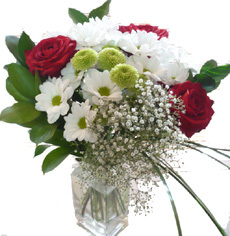 A delicate mix of red roses with white chrysanthemum with greenery in the european shaped basket. 9 red roses, 5 chrysanthemum, 2 ghypsophillas, greenery. Beautiful bouqet with 3 holland lilies, 6 red roses, 5 gypsophillas with greenery in a natural wrapping will be a great surprise for your beloved! 5 pink lilies, 5 pink roses, 3 ghypsophillas with greenery in a glass vase. A very bright spring mix bouqet with 10 sunflowers, 7 roses, 7 eustomas(we can replace it for the different seasonal flowers), 5 statica, greenery in a natural wrapping will stay long and will brighten your day. 4. Wait for redirection to online secure server page.